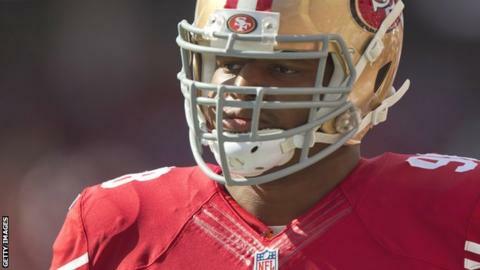 Former British Olympic discuss thrower Lawrence Okoye has signed for the Arizona Cardinals after being released by NFL rivals San Francisco 49ers. Londonder Okoye, 23, who still holds the British discus record, left the 49ers last week after two seasons trying to establish himself. After franchises finalised their squads over the weekend, Okoye said: "Really excited to join the @AZCardinals. "Big thank you to everyone that has supported throughout this journey." Okoye added: "9ers fans have been awesome with me throughout my time there - will always appreciate you no matter where I'm at." Jack Crawford made the Dallas Cowboys' 53-man roster, but other Britons did not have such good news over the weekend's roster moves. Former London Warriors defensive end Efe Obada was released by the Cowboys. Rookie running back Jay Ajayi has been moved to the Miami Dolphins' injured/reserve list because of a chest injury. Manchester-born offensive tackle Menelik Watson ruptured his Achilles tendon late last month and has also been placed on the Oakland Raiders' injured/reserve list, likely keeping him out of the entire campaign.